The Rolex Explorer II – at least early examples of it – is called the Steve McQueen, even though Steve McQueen the actor never wore one. No, the King of Cool wore a Submariner 5512, which we’ll cover in a future installment. 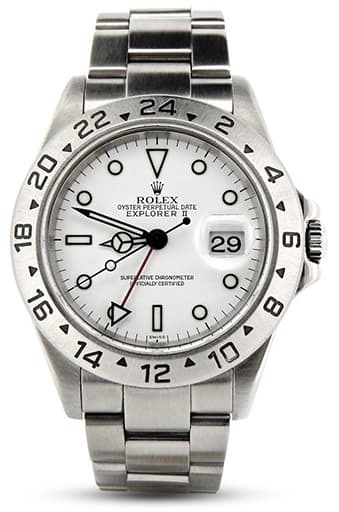 Rolex introduced the Explorer II in 1971. The watch was basically a GMT-Master with a stationary steel bezel engraved with even hour markers 2 through 24. Odd hour markers were hash marks (later to become triangles). The watch was supposedly for speleologists (cave explorers). While its usefulness to that niche may be genuine, we’re pretty sure the niche itself is way to small to sustain production of a watch like the Explorer II. No matter. The watch also proved popular with other professionals who work with military time, but not multiple time zones. For the first three years of production, the Explorer II, ref. 1655, was made with an orange GMT hand. Rolex updated the watch in 1974 with a red hand. It continued that way until 1985. In 1986 the Explorer II, now ref. 16550, got a sapphire crystal and the calibre 3085 movement, which featured an hour hand which could be set separately. Now speleologists could study caves in another time zone. As with all Rolex watches, the Explorer II received incremental improvements along the way. Along with new movements, these improvements included changes to the bezel engraving, hour points on the dial, and finally, a new hour hand. Later models featured the typical Rolex mercedes hand set, while early models had stick hands. The Explorer II has always been a niche watch. For that reason, not all that many were produced. And in the early days, they sometimes sat on dealer shelves for years (yeah, we know… you want a time machine now). But as with other Rolex models that suffered a similar early fate (the Daytona was famous for this), early examples of the Explorer II have been the buzz on Rolex forums for the last few years. And because of the rarity, they’re in great demand by collectors. Pretty good for a horological namesake of the guy who never wore one. Ever wonder about the backstory of your favorite Rolex? Well, stick with us. This is the sixth in a series of posts featuring histories of significant Rolex models. In all, Rolex has introduced nearly three dozen models since 1950. Over the next several weeks, we’ll touch on each. You’ll find all the reference numbers connected with each model here>.